An anime about cats. Instant win, or is it? The Cat Returns is another wonderful compilation by Studio Ghibli as they never ceases to amaze me with their unique stories and interesting characters. The Cat Returns is something of a loose spin-off of "Whisper of the Heart" as it features two characters from that film: Muta (the cat from "Whisper") and the Baron (the cat statue from "Whisper"). There is no other connection between the two movies and this is not a sequel. The story is based on Neko no Danshaku (Baron of Cat) by Hiiragi Aoi. The main character of the story, Haru, is a clueless, ordinary 17-year-old girl. She has no special abilities and neither is she an extraordinary beauty. When faced with reality, she is unable to make decisions for herself, thus often sways to others' opinions to avoid challenge. One day, Haru saves the life of a cat without considering her own safety. The cat turns out to be the Cat Prince from the Kingdom of Cats, however as a result, Haru is trapped in the world of cats. Can Baron and Muta rescue Haru who has wandered into the world of cats? The Cat Returns is another unique and original story by Studio Ghibli. It is about a 17 year old girl that is indecisive in life. As a result, she encounters a cat which is actually a prince in the 'Kingdom of Cats'. Thus, she is thrown into the world and she has to find a way back out whilst avoiding and overcoming many personal and external problems. The story is just uniquely funny and magical. It is just like a fairy tale. The story is well told with many hilarious and exciting moments. The art is just like any other Studio Ghibli film. Their unique trademarked art style really shows here, with pencil drawing like animation to fluid textured backgrounds. The characters were detailed and they had the most unrealistic facial expressions compared to other anime. The art was cute and naive. Just how Studio Ghibli films are made. Voice acting was perfect for all characters. Even the cats sounded right. Everything just felt natural and brought out. 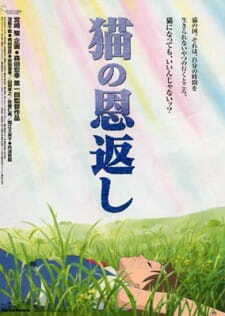 The theme songs were genuinely pleasant and like any other Studio Ghibli film- classical in its own way. The characters were all different from one another. Even the cats had their own personalities and traits. Different shapes, sizes and colour cats are evidently everywhere throughout the whole anime. You will come to like your favourite cat after you have finished this film. Overall, it was refreshing and enjoyable to watch. It is nice to see another wonderful and imaginative production by Studio Ghiblit once again. If you are into cats then you will love this film. Unique art style for sceneries and characters. Classical music to complement a nice anime. Voice acting was perfect. All different types of cats- take your pick. A enjoyable anime to watch with family or kids.